Shanti Maurice is a boutique lifestyle resort with an award-winning spa located around a pristine horseshoe coral sand cove, on the largely untouched south coast of Mauritius near the small town of St Felix. 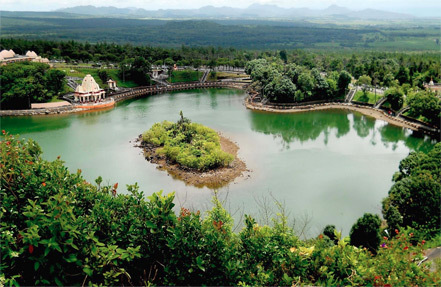 Formerly known as Shanti Ananda and a sister property to Ananda in the Himalayas, the re-launch of the resort marks a departure from the Ananda brand, with its Destination Spa roots, and embraces a genuine Mauritian experience. 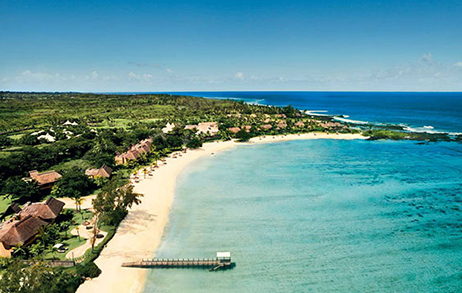 Set between the turquoise of the Indian Ocean and the vivid greens of the sugarcane fields, Shanti Maurice provides its guests with access to the sights, sounds and flavours of the unique mix of Indian, African, French and Chinese influences that form the Mauritian culture. From sourcing the majority of the restaurants’ ingredients from the island’s farmers and fishermen, to supporting village crafts by supplying hand-woven beach carriers, the new team at Shanti Maurice has taken enormous care to work with the community both to respect its environs and minimise the impact of the resort on it. The pride of the almost exclusively local staff at the resort is evident throughout the Shanti Maurice experience, manifesting itself in genuinely warm and caring service. The resort’s philosophy is built on a desire for guests to use Shanti Maurice as a base from which to experience the very best that the real Mauritius has to offer. Shanti Maurice’s genuine wish is that travelers arrive as guests, leave as friends and return as family. Covering 208 sq. metres, the eight Luxury Villas have a temperature-controlled swimming pool, a garden and an enclosed courtyard with an outdoor rain shower and lounge beds. ‘Sala’ pavilions, for dining or relaxation, stand in the garden, while the interior accommodation includes a large bedroom, bathroom and a separate dressing room with a walk-in closet and dressing table. The large living room adds an elegant extra dimension to the Luxury Suite Villas. Bringing the total space up to 376 sq. metres, the living room gives the villas a sense of bright and airy spaciousness. The five Luxury Suite Villas have a 54 sq. metre temperature-controlled swimming pool, a private garden and an enclosed courtyard with an outdoor rain shower and lounge beds. ‘Sala’ pavilions, for dining or relaxation, stand in the garden, while the interior accommodation includes a living room, bedroom, bathroom and a separate dressing room with a walk-in closet and dressing table. Covering 81 sq. metres, the 44 Junior Suites are among the most generously proportioned in Mauritius.Designed to blend modernity with practicality, they’re housed in attractive villa buildings with four suites per villa. Like all guest accommodation at Shanti Maurice, the suites are equipped with plasma TVs, DVD players and broadband Internet access. The ground floor suites ( Junior Suite Beachfront) have direct access to the beach, as well as an outdoor rain shower, while the suites on the first floor (Junior Suite Ocean View) have large balconies overlooking the Indian Ocean. As well as large bedrooms and bathrooms, each Junior Suite has a separate dressing room with an open closet and dressing table. At Stars, the signature restaurant at Shanti Maurice, Chef Reinbacher uses the freshest ingredients to create a vibrant ‘local fusion’ cuisine heavily influenced by both the culinary heritage of Mauritius and the Cape Province of South Africa. Dishes are accompanied by carefully-selected South African wines, exemplifying Chef Reinbacher’s belief that wine from the same hemisphere complements local ingredients, whilst also minimising ‘food miles’. Pebbles offers an international, all-day dining menu, with cuisine reflecting the rich diversity of Mauritius’ cultural roots of Europe, Africa, China, the Middle East and India. The restaurant also offers spa cuisine, for guests preferring lighter, healthier dining options. The resort’s rustic beach-side Fish and Rhum Shack celebrates the bounty of the surrounding seas, serving the freshly grilled and barbequed ingredients. Rhum cocktails feature rum from the local distillery while the beer selection comes from the village brewery. In keeping with the rustic cuisine, Fish and Rhum Shack also regularly features Sega dancers from the local village. The Red Ginger lounge bar is the perfect place to rendezvous for a pre-dinner aperitif or latenight cocktail. By day, the bar offers views across the infinity pool and beyond to the Indian Ocean; at night, discrete lighting picks out the sculptures and foliage in the exotic poolside gardens. Experienced bar tenders are on hand to conjure up a full range of cocktails from the most traditional highballs and white ladies to rum punches and exotic juices. 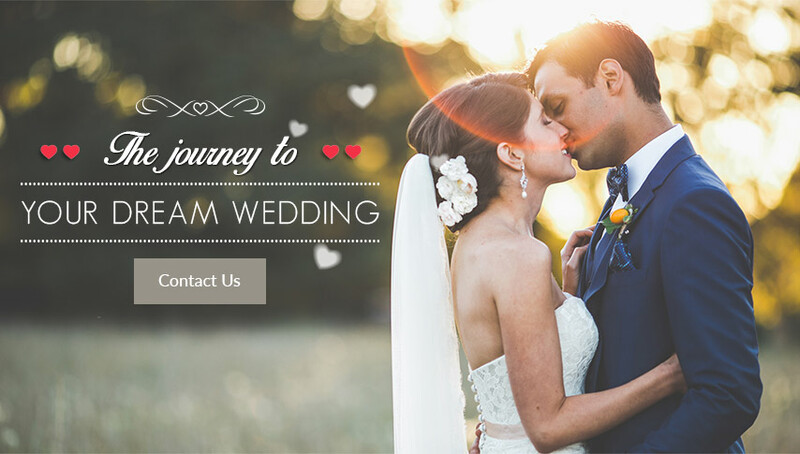 Shanti Maurice wedding packages are crafted with the principle that every wedding ceremony should be a unique and personalized experience for every couple. Thus, the 5-star hotel and luxury resort offers a selection of options that have been designed for your contemplation, so as to ensure truly magical memories. At Shanti Maurice boutique lifestyle resort you and your better half will be heartily welcomed in a luxurious environment of exotic gardens, pristine white sands and spacious accommodation. Regardless of the type of package you choose, the hotel will give you the chance to do one of the most romantic and mellow deeds as a newly married couple - to plant a tree together in Shanti Maurice's garden. And if you wish to add a traditional Hindu touch on your wedding ceremony, you can ask for the blessing of Shanti Maurice's matriarch. Also, a professional photographer will stay by your side in order to capture the most precious moments of your special day. The hotel has crafted three wonderful packages, all equally enticing and majestic. The Flutter of Romance Package offers key elements for an elegant wedding that will stay in your rosy memories forever. From the small details of the bridal bouquet and the groom's buttonhole to the additional atmosphere creators, such as the background music, the Flutter of Romance Package has already thought of your most inner desires and made them reality especially for you on your big day. The Seaside Serenade Package is the ardent evolution of the Flutter of Romance Package with several extra advancements that will make your big day to stand out from anything else you have come across before. The ceremony will accompany a violinist, guitarist or harpist depending on the mood you wish to set and the melodies you want to hear. 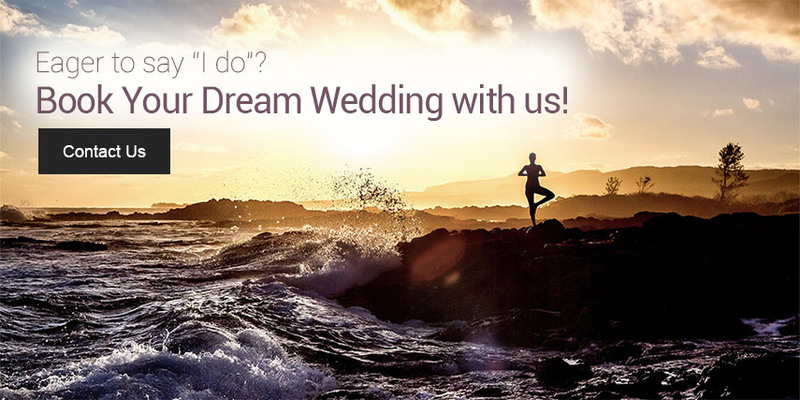 Say "I do" among the still green mountains, the crystal-clear sea and the curved beach. Shanti Maurice's gardens are ideal for the couple who dreams of leisurely strolls at sunset or moonlight walks after dinner, accompanied by the melodic sounds of tropical birds. Mango and lychee trees grow in the orchard, and bread fruit trees, coconut palms, bougainvillea and frangipani can be seen across the public and private villa gardens. Shanti Maurice takes special pride in its award-winning Nira Spa, which comprises 75,000 square feet of unsurpassed, restorative, soothing, invigorating and rejuvenating perfection. From personal well-being to enhanced spirituality and from positive dietary changes to re-energizing exercises, Nira Spa will introduce you and you partner to a whole new self through a signature treatment, as part of the deluxe Island Paradise Package. The peaceful haven presents a unique world of relaxation, serenity and wellness through 4 distinct stations: The Holistic Bio Experience, The Indian Experience, The Oriental Experience and The Fitness & Wellness Experience. If there are ideas and desires that don't fit in any of the above recommendations, Shanti Maurice is taking it a step further with a series of eclectic optional services. Whether it is a dazzling bonfire on the beach, a helicopter tour, a catamaran cruise, or a romantic tailor-made dinner on the jetty, nothing is too much to ask from the gracious family of Shanti Maurice. Blessing in true Mauritian style by the matriarch of Shanti Maurice's family: "Grandma"
Shanti Maurice is a 5-star hotel and luxury resort that perfectly combines elegance, privacy, warmth with sincere dedication to each and every guest. Shanti Maurice comprises of 61 spacious suites and villas, spread across a 36 acre landscape of fragrant tropical gardens. The room interiors follow a unique tropical theme, utilizing a balanced palate of natural materials including local hardwoods, lava stone, granite, marble and slate. The suites and villas at Shanti Maurice are all ocean-facing, and are among the most generously proportioned in Mauritius. All the villas have private pools and are surrounded by exotic private gardens, terraces and courtyards. At this boutique lifestyle resort you and your better half will be heartily welcomed in a luxurious environment of exotic gardens, pristine white sands, a sublime spa, spacious accommodation and restaurants brimming with fresh ideas. Between the still green mountains and the crystal-clear sea, the curved beach is the perfect place to curl up under a parasol with a good book and a classic cocktail. Shanti Maurice's gardens are ideal for the romantic couple who dreams of leisurely strolls at sunset or moonlight walks after dinner, accompanied by the melodic sounds of tropical birds. Mango and lychee trees grow in the orchard, and bread fruit trees, coconut palms, bougainvillea and frangipani can be seen across the public and private villa gardens. Shanti Maurice takes special pride in its award-winning Nira Spa, which comprises 75,000 square feet of unsurpassed, restorative, soothing, invigorating and rejuvenating perfection. From personal well-being to enhanced spirituality and from positive dietary changes to re-energizing exercise, Nira Spa will help you lead a more holistic lifestyle. The peaceful haven presents a unique world of relaxation, serenity and wellness through 4 distinct deluxe spa stations: The Holistic Bio Experience, The Indian Experience, The Oriental Experience and The Fitness & Wellness Experience. 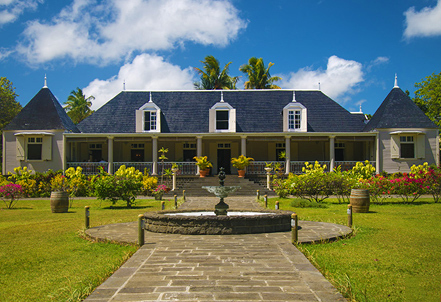 Shanti Maurice offers extensive dining options with an emphasis on locally-sourced fresh fare from the island's farmers and fishermen, or utilizing herbs (citronella, rosemary, basil, mint and coriander) and vegetables (beetroot, broccoli and onion) grown on the estate's herb garden. The resort's signature restaurant, Stars, is defined by its contemporary Cape cuisine and wide selection of South African wines. Pebbles restaurant offers an international menu, influenced by the flavors of India, whilst the resort's rustic beach-side Fish and Rhum Shack celebrates the bounty of the surrounding seas, complemented by cocktails using rum from the local distillery and a selection of beers from the village brewery. 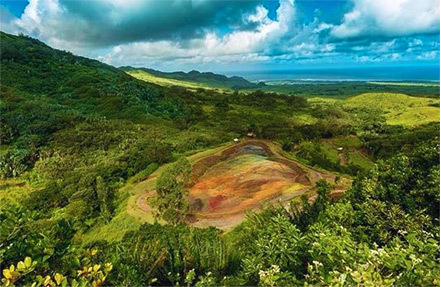 For a bucolic and romantic lunch for two, you and your partner can enjoy a gourmet picnic on one of the endless spots that are at your disposal on the 36-acre exotic garden in Shanti Maurice. The staff is delighted to provide you with hampers and a chilled bottle of wine for you to enjoy. 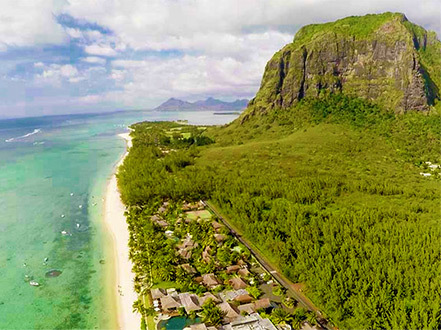 Set between the turquoise waters of the Indian Ocean and the vivid greens of the sugarcane fields, Shanti Maurice enjoys the natural beauty of the largely untouched south coast of Mauritius. Shanti Maurice is close to the peaceful beach of St Felix called Chemin Grenier, which stretches for over 1.5 kilometers from Riviere des Galets to Riambel. There you will feel the serenity and you will indulge into a mood of complete relaxation. If you wish to discover the contrast to the calm turquoise lagoons that Mauritius is so well known for, visit the island's most southern point - not very far away from Shanti Maurice - known as Gris Gris. In this area there aren't reefs to protect the coast, so the waves strongly crash on the shore creating a marvelous natural effect. Feel the power and vastness of the ocean at Roche qui Pleure (The Weeping Rock) where the waves break directly on the cliffs giving the impression that the cliff is crying. The Rochester Falls attraction is also nearby Shanti Maurice, and it's definitely worth visiting. The falls tumble from the Savanne River from a height of about 10 m where constant erosion has sculptured the basalt rock into upright columns. Nira Spa is built around an enchanting tea pavilion,surrounded by lily ponds and indigenous flower gardens. Covering over 75,000 sq. feet and comprising 25 treatments rooms, Nira Spa is one of the largest and most comprehensive in the Indian Ocean. Trained masseurs and spa therapists work alongside nutritionists, personal trainers and Ayurvedic Doctors to encourage optimum health and mental wellbeing. The resort plays host to a myriad of leisurely pursuits that range from the energetic to the contemplative; for the more youthful and those wishing to feel so; on dry land or otherwise.The hotel is happy to make available to you a wide variety of sports and recreational activities, including non-motorised watersports, tennis, golf, jogging, trekking, power walking, aquafit, pilates, finger painting, garden tours and cooking classes, to name but a few. The resort offers two floodlit tennis courts, both of which are naturally sheltered by the landscaped gardens that surround them. The Concierge can provide a playing partner or for those wishing to improve their game, can arrange a private coaching session with a tennis professional. Additionally, complimentary group tennis initiation is offered daily. From dolphin watching to kayaking, the activities arranged by the team at the boathouse include most aquatic pursuits. Fully qualified staff arrange regular group sailing and windsurfing initiation classes, along with snorkeling sessions and kayaking. Other available activities include deep-sea fishing, scuba diving, waterskiing and windsurfing. The specially designed Kids Club is set within its own grounds beside the Nira Spa and comes complete with its own toddler’s pool, games room (including snooker, table football and tennis), children’s DVD films, computers, Play Station and Wii games. Infants below 3 years are welcomed and should be accompanied by a baysitter. A weekly activities programme, crammed with fun-filled pursuits, such as flower making, kids yoga, face painting and musical games ensure that the younger guests are entertained during their stay. 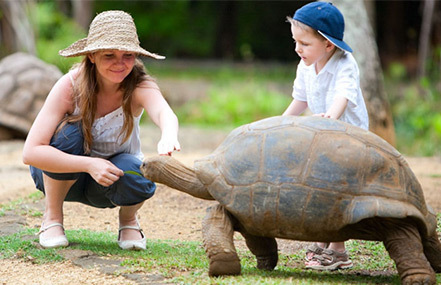 In addition, field trips are arranged to the nearby Crocodile park and Casela bird sanctuary, where younger ones can make friends of the furry or scaled variety. Please note that children are not permitted in the Spa Pool or the Watsu Pool. They are welcomed to use the children's pool and the main pool. Access to the Nira Spa pools is restricted to 18 years old above.